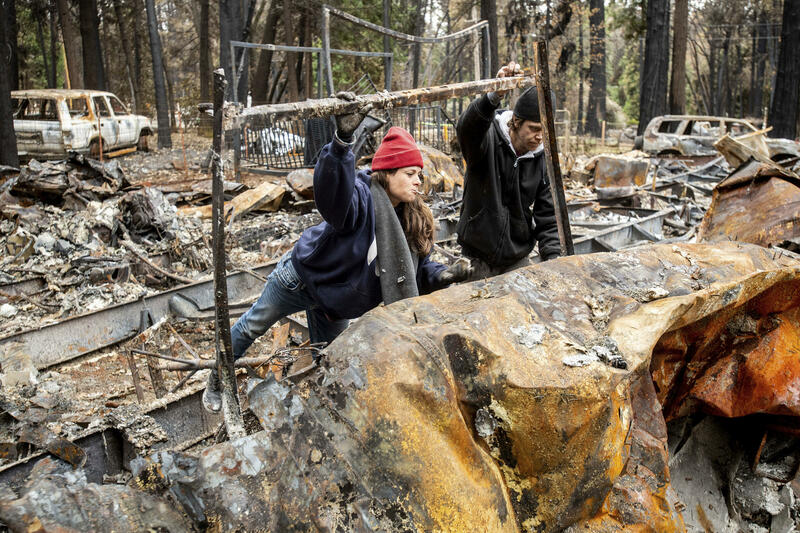 Sara Sullivan searches for belongings at her Magalia, Calif., home, destroyed by the Camp Fire, on Tuesday, Dec. 4, 2018. Over loud and angered objections, town of Paradise and Butte County leaders officially barred fire victims from moving home until debris is removed. No amount of reasoning, begging or threatening by locals could turn the tide and have elected leaders change their mind. Facing a threatened cut off in funding for debris removal, elected leaders Monday enacted new rules banishing fire victims from their properties until the burnt remnants of homes and other structures is removed. While debris removal began Friday and residents can occupy cleaned lots, officials won’t get to the last properties for a full year. That didn’t sit well with Paradise resident JC Martin, whose comments were streamed online. “How do you plan on enforcing this ordinance? Are you going to put your employees’ lives at risk by trying to enforce this stuff? Because there are certainly people in this town that may go to extremes. There are children attending school in Magalia which has burnt properties all the way around it. Why is this acceptable yet an adult property owner can’t make their own decision whether they want to live on their own property” Martin said. Enduring an onslaught from a restive crowd, Paradise Mayor Jody Jones told the assembled that she largely agrees with them, but has no other choice. She said unless the town relented, FEMA would refuse to pay for debris removal, leaving the cash-strapped town with a $1.7 billion dollar liability, along with a decimated tax base.